CEO Elon Musk says an updated Tesla Supercharger map is coming in the next few days. We’ve known full well for quite some time that Tesla is continuously adding Superchargers all over the world. This has been especially true with the introduction of the Model 3, since now in any given month, thousands of new Tesla owners are taking to the streets. Aside from the information above, what we didn’t know for sure (and still don’t) is how many Superchargers the company is working on at the current time. New Tesla Model S P100D owner and Twitter user Kevin Mitnick sent a question Musk’s way asking for any news about adding Superchargers in his area (Woodland Hills, CA). In usual fashion, Musk responded personally. While it wasn’t within minutes like we’ve seen on many occasions, he got back to Mitnick on the same day, only about six hours later. The fact that in his busiest of times the CEO still finds extra time to reach out and/or reply to customers via Twitter is always impressive. In regards to Musk’s reply, he said 1000s. We feel this is taken to mean 2,000 or more. However, it’s unknown how many are in the permitting process versus how many are currently being built. Also, we have no idea how long it generally takes from permitting to a finished product. Nonetheless, not unlike the automaker’s Model 3 VIN registrations, this is a good indication that much progress lies ahead. Hopefully, in the coming days, we will have that updated map with more concrete details. 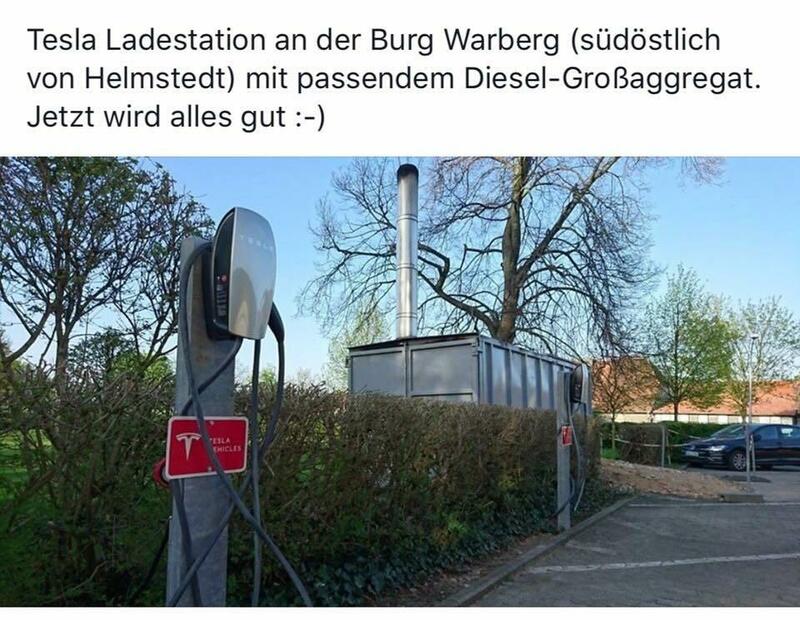 80 Comments on "Musk – 1000s Of Superchargers Are In Permitting/Construction Phases"
In Europe the Superchargers in construction are presented with Grey spots on Tesla maps. They all make a huge sense for me in France, showing that Tesla really analyses the key long trips car users make every year and refines their network to accommodate them the best way possible, including reducing the distances between two Supercharger locations from say <200km to <100km, to prepare for Model 3 intro here with lower battery capacity. No, the grey is there Tesla hopes they will open super chargers in the future, then it will happens is a good question. They have been grey marks for super chargers down to Istanbul since 2015 I believe and they have not been under construction that long. Will they also be diesel powered like that one? A Tesla will still go further with electricity made on a diesel generator than a diesel vehicle would on the same amount of fuel. That was debunked– they didn’t validate their starting and ending charge levels independently. The basic physics underscores what a crock that video was, but it got great airplay in the Church. If a serial Tesla basher like you says so, we can be confident it’s not true. Good job locating the negative exception to the positive norm. To be fair, while you’re at it, why don’t you spend the next 8-10 hours posting all the pics of the Supercharging locations with solar attached. Because…that would contradict his negative agenda of being a serial anti-Tesla troll. There’s also those drag-racing enthusiasts who hooked up a couple of home high-power chargers (which is essentially all a destination charger is) to the back of a mobile Diesel generator on the back of a truck so they could charge at the track (sorry, can’t find pics or a link, but it was a couple of years ago). I guess they just like Teslas for the speed, not for saving the planet. I’m sharing it because I find it hilarious. It is not even a diesel generator. It is a wood pellet fired heat generator. Not if Musk can help it …that’s aFluke..
That button you see, with your name on it. Please press it down, really hard. uups. Was that the wrong button? Ooh, ooh, let me, let me! That’s not a Supercharger, but thanks for playing. 1) So a diesel generator of that size has nowhere near the capacity to run even a single supercharger. 3) It’s highly unlikely, to the point I would say I’m certain, that the generator is connected to the chargers in any direct fashion. 4) I would bet money that is simply a backup generator for a nearby building, that happens to be located near the destination chargers for that building. Which would make sense because the power infrastructure / connections would all be in the same physical area. 5) Nice try though, that’s almost funny. This is a fake to compromise Tesla. The “diesel” is a pellet-heater and has nothing to do with the charger. Sweet!! It’s a great time to own a Tesla. I believe that it’s never gonna be better than from right now to a few years down the road before the MASSIVE amount of Teslas flood the roads and highways. As more folks own the cars and the Supercharging network becomes more accessible to the casual, uninformed EV owner, the etiquette and accessibility to the Superchargers will diminish.. Charging for supercharging will mitigate most of this. I bet the majority of supercharger use right now is not because of a need but because it is free power. Once it is not free power, usage will decrease substantially. Currently there are 1252 Supercharger locations. And these were realized during the past six years. How many Supercharger stations will there be on January 1st, 2020? A Million …..I hope ! How can they afford to do this? How expensive is the charging for Model 3s? They charge you the local charge for electricity. Between 08-26 cents. Around 12cents per kWh, on average. I talked to a new TM3 owner a couple weeks ago and he said a full charge is costing him about $15 here in CA. How far does it take the TM3? Stop asking logic based questions! How dare you interject logic into a Tesla conversation – More Tesla is Better Tesla. I’ve driven Prius and I’ve driven Tesla. More Tesla is better Tesla. Are you actually comparing a Tesla to the Prius?! WOW!!! So says the shorter troll. Well, on a full charge the TM3 is rated at 310 miles. Although apparently one hypermiler got 515 miles on a charge recently. But will it? What if you’re going uphill or have to run the AC or you drive 80MPH? Your claim is highly dubious in a real world situation. Hmm…According to Supercharge.info, there are currently 107 locations going through permitting/construction. Taking an average of 12 chargers per station, that translates to 1,284 charge points that are undergoing permitting/construction. I wonder if this is what Elon is referring to. Yes, he said Superchargers, not stations. As you said, 1000s of new stations would be exorbitant. But, 1000s of new Superchargers makes sense. But sueprcharge.info is not an exhaustive list – there are things that don’t show up until a TMC member finds one (either a publicly published permit or actual construction site) and notifies the supercharge.info site owner. If you look at the supercharger map on Tesla.com, there are tons and tons and tons of grey (future) dots on the map. He said there’d be a new map coming out soon. Perhaps your info isn’t up to date since it hasn’t been, you know, updated yet. This is music to my ears… Hoping for more superchargers than gas stations, all earning tons of money for Tesla. It is coming, you better believe it. People just don’t realize how much of a land grab this is. Land grab? Explain. Most superchargers I’ve visited are at the far end (least used) part of a parking lot that already exists. Following the news on this site it seems like Tesla Supercharger is the only existing charging network. In Europe alone some 600 Locations (not Pluggs) have been added on the CCS Type2 network in the first 4 months of 2018. In total some 4600 locations are available. Several companies are currently installing the first 300kW stations, with plans of several hundreds to be added for the next 2 years. We cover a myriad of charging topics and networks. I would argue that Tesla’s Supercharger system is the only one that’s worthy of being called a “network”. The CCS and CHAdeMO chargers are placed individually, in a haphazard fashion, with no overall planning or any attempt to make their placement part of an overall network. VW’s “Electrify America” also appears to be an attempt to build a network, but I don’t think enough of those have yet been deployed that it’s really a network. Call it a network-in-progress? Bingo. Nobody else can claim to have a network of any value. But they’re nice supplements to the Supercharger network if you’ve got an adapter. They are mostly placed along the motorway at rest stops. I agree that different providers operate them, but they can still be used with a single sign up to a roaming network. I also don’t care at which companies gas station I pump. Why does the single brand matter? If only they could coordinate with Electrify America to reduce infrastructure and permitting needs….I don’t mind Tesla having their own charging network despite not owning one but at least work together to benefit all EV owners. It’s like having a shell and chevron station across the street from another. Why not work together at one site (of course larger to accommodate all the stations) but still offer an array of networks. even more important, it would be like shell and chevron have different nozzles that only fit into one brand of car. it was a great idea to jump start the technology change, but it’s complete stupidity at this point that they do not enable local standards (e.g. CCS Typ2 in Europe). Right. All the Superchargers in the world don’t help non-Tesla EVs. I look forward to the day when EV charging plugs are as standardized as gas station fill nozzles. Although I guess it will take some more years for that to happen. Let’s just hope that competition drives innovation and finally all networks decide to change to one standard. when you would carry around your phone specific charger? Supercharging is the differentiating factor in Tesla’s overall marketing and sales strategy versus the competition, and a very good one. So why should Tesla co-ordinate anything like this with others that are engaged in providing a competitive service? They throw all sorts of legislative and bureaucratic hurdles in Tesla’s path, and berate the company incessantly, so don’t expect Elon to do the rest of us any favors. After all, Tesla does own those superchargers and spends all that money building the networks. Also, Tesla charging plugs are not compatible with other EV models. Because coordination between networks is a win win for everyone. The faster the stations are built, the better the EV experience. For example, let’s say Electrify America submitted plans to a city for a fast charging station. Tesla could tag along in the permit and install their stations on the same site. Everyone gets their own plug but in a centralized location where they aren’t fighting for land and it’s quicker through a more streamlined approach. Essentially it’s economies of scale. That’d be interesting. You’d have Superchargers next to CCS and with Teslas swamping the other brands, you’d pull up and find all the Tesla stalls full, plug into the CCS, go wash your hands and get a bite to eat and come out to find someone in a Bolt steaming because your Tesla has the only CCS stall and all the Superchargers are empty. Let the social media shaming begin! Why? Because ultimately, having three competing charging formats is worse than the VHS vs. BetaMAX “war”. A true universal charging standard would benefit all plug-in EV drivers, not just those of one auto maker vs. another. Having three different competing charging formats is as stupid as if there were three different kinds of fill nozzles at gas stations, so any gasmobile could use only one gas station out of three. Cooperation, not competition, is often best for everyone. That’s a win-win for everyone, rather than an “I only win if you lose”. Notice how very quickly the one-and-only DVD standard grew its market, unlike either VHS or BetaMAX! And we will see the DVD equivalent one day. And luckily it will be easier to change all plugs. They won’t have to throw away the expensive pieces of hardware which make up a charging station. Just change the cable and the plug (and the firmware) Done. If any of the competition had wanted to have their cars access the SC network, they could have bought into it. But they never wanted to put the money up to build it. The best of all worlds would be a common plug design to reduce the need for adapters. From there, it would be better to have the sites more diffuse. When we were planning a trip to southern Ohio (from Chicago) we went past Indianapolis, but with the Supercharger all the way on the south of the city, we had to take the west loop around Indy instead of the shorter route. If Tesla and EA and anyone else working on this problem were all building to the same standard, we could take whatever route we wanted sooner. One of the things I had hoped HRC would have done had she been elected is to open up the nation’s rest areas to EV charging stalls. There’s a weird regulation preventing commerce at those locations that’s still preventing them from being installed in most spots. But every highway rest area should have DC fast chargers so when you stop to pee, the car tops off a bit. Kevin Mitnick is a famous hacker. Glad to see he’s getting an EV. Yeah, when I saw that name, I checked that twitter account to see if it was the same person. I do know that there are some of the Urban Superchargers going in down the road from me here in San Bernardino at the mall. It’s not free any more, so? I’d rather get plugin hybrid with 60~90 miles AER. Is it because you’re homeless and can’t charge at home? Or you are against free charging? ….cause you know, in CA we have plenty of those too. So says a shill for Big Oil. supercharge.info has a pretty good map of things under construction. Crowdsourced info. OH, yeah. This is really helping them get ahead of the OpEx problem. That’ s the best you got? Good! You can go to https://supercharge.info/ and see which ones are complete, in construction, and in the permitting process. I was going to add the link for people to check, but it seems to be down. I can’t get it to load. All the stories about Musk’s comments on superchargers must be drowning their website. It was slow to load for me, but eventually came up.